We design and deliver solutions for parents, schools, and organizations to improve the health of America's children. Growing Healthy Kids, Inc. is a non-profit organization working to improve health literacy and halt, reverse, and prevent childhood obesity...because failure to protect America's children from obesity-related diseases is not an option. Enjoy WELLNESS WEDNESDAYS! Kids are naturally curious. Parents owe it to their children to use that curiosity to feed a lifetime of learning. Learning about food is fun when you use all your senses. 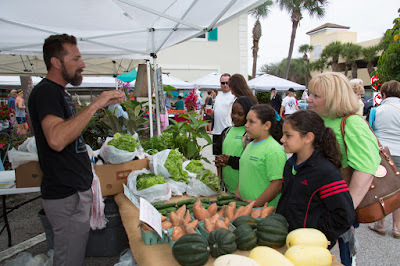 In the Growing Healthy Kids movement, we introduce kids to farmers, new foods, and cooking techniques. We teach kids to see, smell, and taste foods with wonder and awe. The younger kids can start learning about real food and basic cooking skills, the healthier they will be over their lifetime. Recently, a volunteer from the Sunrise Vero Beach Rotary Club chaperoned kids on a Growing Healthy Kids' visit to the local Farmers Market. One of the market vendors had prepared guacamole for sale and was offering samples. The kids on our expedition passed on the opportunity to sample it. The next week, making guacamole was on the menu for our class of middle school students. The same volunteer was in charge of the guacamole station, where kids did all of the food preparation. After all the guacamole was inhaled by hungry kids, he later made the observation that when kids get to make something themselves, they will try it without hesitation. from Alex Gomez of Pure Produce. Below is our recipe for the fabulous guacamole that the kids loved making and eating in our recent class. Gently mash ingredients together and serve with corn chips. Avocados are a fruit. Most of the calories in avocados come from unsaturated fats, which are the good fats we need. Other sources of unsaturated fats include olives, nuts, and seeds. Founder, Growing Healthy Kids, Inc.
Nancy L. Heinrich, M.P.H. is an epidemiologist, author, and wellness coach who transforms the lives of people with diabetes – and their families – so they are in control of this disease and no longer living in fear of it. She creates simple-to-use tools that show people where to start and how to get where they want to go. She is the creator of www.HealthyDiabetesCoach.com, an easy-to-understand diabetes education course. Her extensive public health background includes work in HIV/AIDS, tuberculosis, sexually transmitted diseases, and hepatitis. Nancy is a member of American Public Health Association and American Association of Diabetes Educators. In 2009 she founded Growing Healthy Kids,Inc., a non-profit organization which designs and delivers innovative garden-based education to children and their families as a means of halting and reversing the childhood obesity epidemic. She is the author of "Healthy Living with Diabetes: One Small Step at a Time" (www.ourlittlebooks.com), NOURISH AND FLOURISH (www.amazon.com) and creator of the "Healthy Living, Healthy Eating, Healthy Diabetes" DVD. All rights reserved. Growing Healthy Kids, Inc.. Picture Window theme. Powered by Blogger.